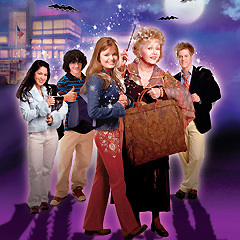 The Disney Channel’s Halloweentown High is one of many movies from the series Halloweentown, which is shown on the Disney Channel on every Halloween. It’s about a teen witch, named Marnie (Kimberly J. Brown), who convinces the council from Halloweentown to send some students from her high school into the human world. But there is an evil knight roaming around the mortal high school, who has a mission is to destroy all things magical and to stop the connection between the two worlds. It’s up to Marnie and her grandma Aggie (Debbie Reynolds) to save the two worlds and to bring peace so that monsters and humans can live together. I love Debbie Reynolds in these movies because she is so funny playing the role of a witch. I think these movies are great for kids to watch. I don’t know if the Disney Channel is still playing the movie series on Halloween, but I do know that these movies are on DVD. Comments for Disney’s Halloweentown High: A Great Halloween Movie For Kids are now closed.